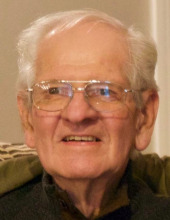 Keith Wayne Kraus, 75, of Evansville, died peacefully at home on Thursday, February 28, 2019. He was born August 27, 1943 in Fort Atkinson, WI, the oldest child of Howard and Helen (Stueber) Kraus. After graduating from Janesville High School in 1962, he served four years in the Marine Corps. In 1972, Keith married JoAnn Kundert and they settled in Evansville to raise their family. In his prime, Keith golfed, bowled, fished and played slow-pitch. Later, he enjoyed watching sports from the comfort of his recliner, remembering back in the day when he wasn’t a spectator. He loved the old black and whites and if it was a western, even better. But everyday started and ended with The Weather Channel. After working at Janesville's General Motors plant for 39 years, Keith walked out of work on February 1, 2006, and into retirement. Much of his leisure time was spent in his workshop with his many tools, some new, some from garage sales, and a few special tools handed down from his grandfathers and uncle. There he could tinker for hours at his own pace listening to a game on the radio or catching an afternoon nap. Keith dearly loved his family and they loved him in return, a kind and gentle father, grandfather and brother. Keith is survived by his wife, Jo; sons, Matthew (Jennifer) of Evansville and Benjamin (Kristi) of Fort Atkinson; grandsons: Collin, Nolan, Hayden, Grayson and Bennett Kraus; granddaughters, Abbigail and Kailey Kraus; and daughter-in-law, Vicky Kraus. He is also survived by 2 brothers, Sidney (Barb Reedy) and Bruce (Lori); and a sister, Beverly Troemner. Keith was preceded in death by his parents; son, Michael; brother, Ronald; sister-in-law, Beverly Engle; nephews, Michael and Brian; and several brothers-in-law. A memorial service will be held at 11:00AM on Thursday March 7, 2019 at St. John's Lutheran Church Evansville with Reverend Matthew Poock officiating. A visitation will be held from 10:00AM until the time of service on Thursday at church. To plant a tree in memory of Keith Wayne Kraus, please visit our Tribute Store. "Email Address" would like to share the life celebration of Keith Wayne Kraus. Click on the "link" to go to share a favorite memory or leave a condolence message for the family.